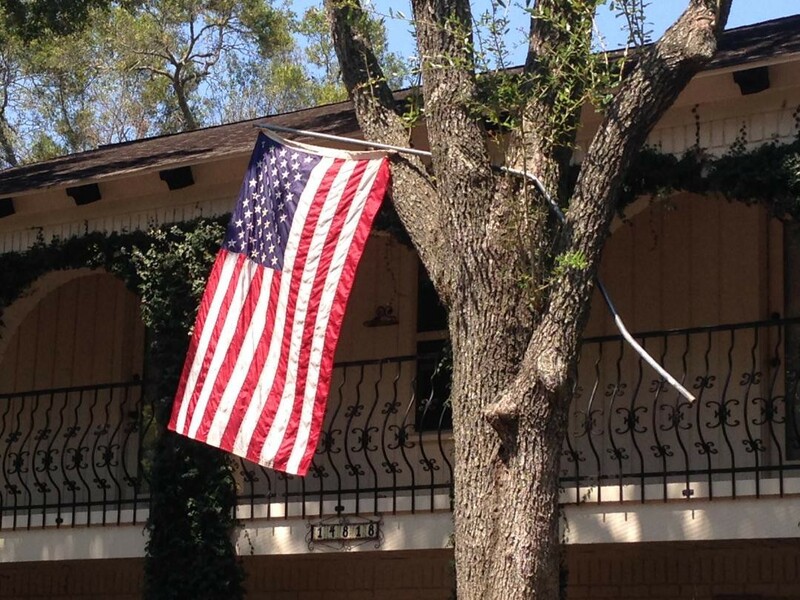 Flag deposited in tree by flood waters of Hurricane Harvey. Our first challenge was getting inside. The back door had come open in the flood, but access was blocked by the washer and dryer that had floated against the door jam. The front door was swollen shut. We finally entered through the slider from the backyard. Clad in boots, gloves and masks, we ventured in. The site and smells that greeted us were not good. Our home was now a wasteland of soaking possessions and destroyed walls and cabinets — all overlaid with an inch of brown, stinky sludge and mold. It smelled like a sewer had overflowed into a swamp. The water line was near the ceiling of the first floor. The devastation was awesome in its thoroughness and randomness. Displaced items showed the power of the water. Most items and furniture were knocked over or moved. My wooden pastel art box floated from several rooms away and lodged itself against the upper cabinets of the half bath. The kitchen table floated up and over and settled down to rest on the counter and island. In the back of the photo, you can see the Sub-zero Fridge that was knocked over after being lifted up and leaving a gash in the ceiling. My grandmother’s china cabinet (which is very heavy solid wood) was tipped over with a couch on top of it. By the way, that couch was about two weeks old and still had the tags on it. Other areas contained stacks that looked like the work of a deranged toddler. Yes, that is mold on the foot stool. After surveying the damage, we re-focused our energy to the second floor which had not flooded. In a show of community support, many people and groups were providing help to impacted families like ours. On that day, we rallied a crew of people — friends, neighbors and kids from the Cross Country team, to help us move items from the second floor to our rental townhouse. The packing was hurried and jumbled. Several of us worked upstairs — with masks and protective gloves on — to toss items in big blue plastic bins and contractor-grade garbage bags. We passed those to people with protective clothing and masks who carried it down the stairs through the muck and outside. Everything was dirty — most of the stairs, downstairs, the yard and grass and driveway — and it was all contaminated. We had to keep clean possessions from touching anything. It was a great relief to retrieve our clothes, linens and personal items from the second floor. Due to the smell and contamination of being in the flooded house for weeks (dry, but sitting in the humid, contaminated air), every rescued piece of clothing and linen and blankets had to be washed and sanitized. I did more laundry over the next week than I had done for years. We had to toss the mattresses and pillows for fear that they were mildewing or moldy inside — and the rugs need to be professionally cleaned. Thanks to all of the help, we got most of the second floor moved in one day and finished over the next few. We had prepared ourselves for the possibility of losing everything on the second floor. So getting entry into the house was actually a relief. We were able to rescue possessions from the second floor and finally view the damage to the first floor. Talent Management Executive at a Fortune 100 company and real estate investor.